There are lot of person want to hide or lock personal chat on WhatsApp. This feature in not provided by the WhatsApp at your device. Now, you can use third party app which allows you to quickly hide or lock personal chat on WhatsApp. You can easily protect your private WhatsApp conversations with your friends, family members and others. After apply the password detail nobody can check your personal WhatsApp chat conversion. You must have to fill the password to unlock Whats chat conversion. Must Read: How do I Configure WhatsApp Privacy Settings? WhatsApp Chat Locker third party app allows you to quickly hide or lock personal chat on WhatsApp at your device. This app is free to use and available on Google Play Store. This app occupied 1.34 MP space at your device. If you have Android 4.0 or upper version then you can easily download this app at your device. If you want to maintain privacy of your personal chats from your family members or other then you can use WhatsApp Chat Locker third party app at your device. You have to take following given steps to hide or lock personal chat on WhatsApp. 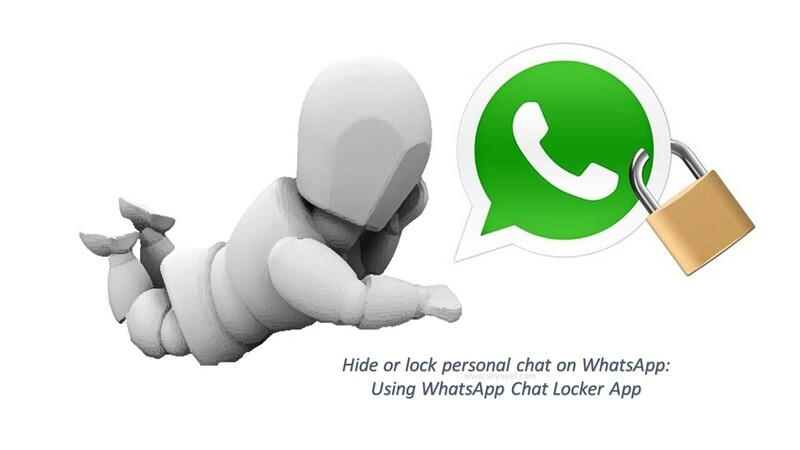 Step 1: Download and install WhatsApp Chat Locker third party app from Google Play Store. Step 2: After finish the installation process open this app and fill the password which you want to use to lock. Again fill confirmation of the password and also fill hint of the password. Step 3: Turn on Lock WhatsApp Chats option and tap on the OK option. Now, your control transfer into accessibility option you can turn on Whats App chat Locker. By default this feature off on your device. Step 4: After turn on this feature please you can choose any particular person or group WhatsApp chat icon to apply the password. After turn on the password feature nobody can check WhatsApp conversation without applying the password. If you forgot the password then you must have to tap on the hint option to view password hint. Most of the person don’t want to share his personal discussion or conversation on WhatsApp. In that situation there is no more feature is provided by the WhatsApp to do this job. But after reading this guide you can easily understand how to hide or lock personal chat on WhatsApp. If you have any suggestion regarding this guide then please write us in the comment box. Thanks to all.